Splice's suite of IT services empower our clients to maximize the efficiency and availability of their IT infrastructure that supports the success of their businesses, their clients and employees. Splice’s Telecom Carrier Management services empowers our clients to let our team fully manage all outage or performance related issues for voice and data services. Splice’s Remote Monitoring and Management solution (RMM), combines our 24 x 7 x 365 U.S. based team of certified technicians with powerful tool-sets and reporting to provide a robust monitoring and remediation solution for network and server infrastructure. Whatever level of support you are looking for, Splice offers fully customized plans. We will go through a full assessment, and design an IT support solution that meets your needs, including US-based or off-shore support. 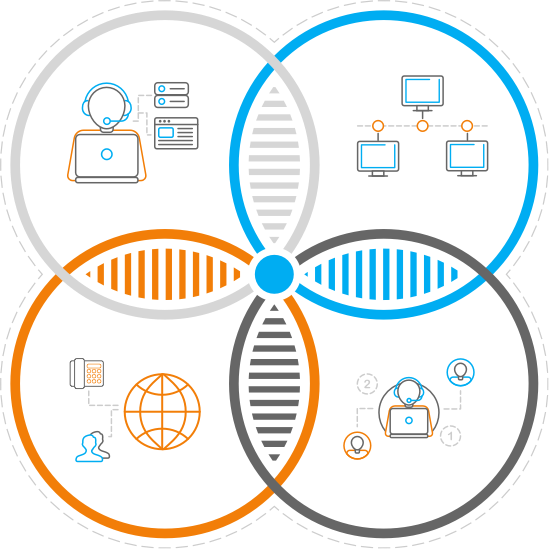 Splice can provide any of these services individually or combined as a bundled solution.